I have been blessed with many musically talented students. I wish I could take credit for this young lady also, but I cannot. 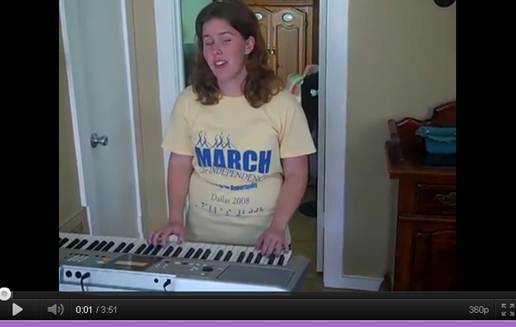 See this wonderfully talented young lady, playing the piano and singing like an angel. It does not take sight to be gifted, it just takes practice. The Student in the link to a YouTube Video below lost her sight quickly and had never touched a computer before 10th grade. She learned how to use a computer with talking software within 2 weeks, which lead to freedom. In the upper elementary school, and beyond, students are asked to make their presentation or research papers look colorful. Where sighted children are cutting and pasting onto their work, blind and low vision students are taught how to make their fonts with great color, putting borders of artwork around paragraphs, words or the whole page. Students also insert pictures and position them where they need along with different types of WordArt. All the Basics of Inserting Word Art and Clip Art just click on Office 2003 or Office 2010 to get what you need. All the Basics on making your font colorful and stylish are found at Office 2003 and Office 2010 The same commands work in both Office products. Enjoy and have fun. Students Love knowing they can do anything their sighted peers can do when the teacher starts giving directions, they just do it on a computer. It is a huge confidence builder and reinforces all their skills now and makes them want to learn even more so they can tackle anything that comes up in the future. First!!! Know that braille readers can read material as fast as print readers. I teach it and see it all the time. Attitude is the first hurtle. Once you know a braille reader can read as a print reader, then you are ready for the next step. Second, if the above is to happen, the child has to start in that 0-5 year old mark. They could read faster if they are older too, but the mental adjustment into braille reading, or the "bad press" on braille being too hard is difficult for many to overcome …thus they are slower braille readers. There are many more reasons off this, but those are 2 biggies. Third, get the child excited about reading–This applies to Blind and Low vision children. Start with reading print/braille books to them, so if they can see color or pictures, they can look at the colors while feeling those wonderful dots. Put braille all over the house using sticky tape (just go to local hardware store and pick up sticky shelf paper and braille label words on that to put all over house). So wherever they touch, they feel braille. Once again, BOTH low vision and blind. This really applies at any age level…so start doing all these steps, no matter what age….they can get over the "bad press" on braille if you have a really positive attitude about it. Fourth, when you are reading to them (this is cuddle time on your lap), have them put their fingers over top of yours and you move your hand from left to right across the page with all 4 fingers down on the page and those 4 fingers slightly curled touching the line of braille, so they can feel the smooth motion across the page (You will be holding the book with the other hand, so don't worry about both hands yet). It does not matter you can't read braille yet…fake it until you learn. Just read the print above on the page, as you smoothly move your fingers across the line of braille. It is the smooth movement you want them to learn. Fifth, when they are babies and toddlers, have all those blind tools around, so they can "scribble" on the brailler, as in pressing the keys, knowing this will be their writing tool. Help them with a slate n stylus to make dots on paper. Also have an older computer around with free talking software, so they can press those letters on the computer and get that cause and effect…They need to learn the computer typing and braille at the SAME time, so they understand how these tools go together later for school. Sixth, when they are ready to start formal brailling of words and letters, and today most children are doing that somewhere between 2-4 years old, so blind, low vision children need to start then also. You will read the word and then you help them braille it. At first, their hands are on top of yours so they can feel the smooth motion of you pressing the keys. Then they get to try. If their fingers are too weak, then look at something like a Mountbatten brailler with very easy keys, that gives verbal feedback along with the output of braille. Now some kids get this right off the bat and do not need help, so figure out your child and how much help they need. Lift your hands off as they begin the journey across the page by themselves…YOU still reading each word before they hit it, so there is NO scrubbing or back tracking on the word to figure it out. As they read, they are going to split their hands several words in on the line and they WILL need help doing this until it is a smooth motion. About 2-4 words in on an 11 x 11 paper, the left hand will go back down to the next line as the right hand finishes the line. As the right hand finishes the line of braille, the left hand begins reading the next line. REMEMBER, you are reading the words for the child before they hit the word, so they get and continue that smooth motion with NO scrubbing. Keep it simple. Braille sentences with contractions and about 3 words each. I like cats. and so forth…..keep it up and this child will be reading 300-400+ words per minute by high school. If you are one of those creative imaginative people who can create pictures in your head then you can braille that picture straight out on a brailler, great, but if you need more direction, see below. Here is some more guidance. You will draw the picture first, then insert into a brailler and braille over the picture. You can tactile the picture while drawing it out on sandpaper using a draftsman tool kit or use a window screen, and lay a piece of paper over it and press down with a wooden tool to draw a basic shape….there are many tools out there to do this. Then once you get the basic shape, go back to your brailler, wheel in the paper and start at the top, brailling over the copy you just designed. Sometimes you are going to braille a full cell with all 6 dots, sometimes, only an L or sometimes 4 5 6 or any combination of dots as you move down the sheet. You can make a beautiful border around the sheet also. For my wedding, my mentor had made us an incredibly beautiful card. He was a guide through my sight loss and regaining of it who had a big influence in my teaching style and of whom I also became his student teacher. He had been blind all his life, was very creative and quite a genius to boot, had made us the most beautiful braille picture-wedding card. My sister-in-law wanted to frame it immediately. I told her if she put glass over it, that no one could touch it, and that is what needed to happen. When I student taught with him, we had all the students make cards like this for their parents for holidays. They became very adept…just takes practice, some math, and some perceptual skills. With Halloween, Thanksgiving, Hanukkah, Christmas and all other holidays coming up, this is a great time to practice. I can guarantee people will be VERY impressed…a great confidence builder too. Ok, so if you are not THAT creative you can buy a book and read all about it…I love books and learning. Just click on Drawing with Your Perkins Brailler and order a copy to do some great creative drawing with your brailler if the simple lesson from above is not enough. When the site comes up, just do a search for the book. If the child needs to be quicker about accomplishing a drawing task, Quick Draw Paper is Great, where you just use a very liquid pen and draw away and the paper rises up to feel–but then they may prefer the Draftsman again that is a sandpaper type material and the sandpaper disperses as you draw on it, so you can feel the lines you just made. If you are a teacher and need something like every type of science graphic around, you may want to pick up a Basic Science Tactile Graphics book….if you are a teacher of the blind, you can order this with quota funds from your resource center who works with American Printing House for the Blind…true for the quick draw Paper and Draftsman too. In general, everyone, if you are related to or working with a blind or visually impaired child in anyway…go to APH.org and ask them to send you a catalog. This is an invaluable site. If students are left to their own devices when they first learn to read braille and no one is checking those fingers, a child will scrub, as in move finger up and down or around and around on the dots, or any deviation off these movements. This will not only squash all the braille dots down, scrubbing will make you a VERY slow Braille reader. If you cannot create enough speed when you read Braille, then comprehension will be difficult. You have to be able to read a certain amount of information within a certain period of time or the brain forgets. After you use this one lesson, create others that are exactly like this for them to reread until you see that fluid movement over the braille page. They need to create a good habit of fluid motion across a page, so they must know the content they are reading well…this way they do not have to focus on decoding, but rather the movement. When they want to braille a contraction, make sure they braille a couple of lines of it, then read it over and over before putting into a sentence. This software has been around for more than a year but I did not have a chance to try it out until today. CDesk is a very basic talking software program for older adults who have lost sight or cognitively challenged children in school who cannot remember hundreds of commands to make their computer do what they want it to do. I have trained many adults and I can tell you, the challenge in remembering all these commands starts in the late 20's, so when I say older, you may be included in this category where technology is concerned. You can download books straight from Bookshare or BARD. If you are looking for games for blind children and adults, it has that in the Media Center. Simple email that you are already on is incredibly easy to navigate and use. 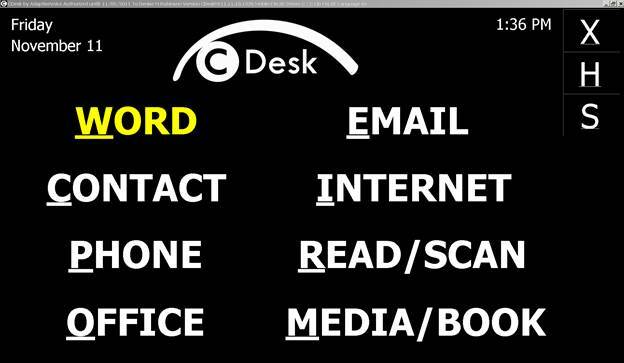 Anything you scan can also be brought right into the CDesk Word and the same commands that you use for word processing are used now for your scanned object. Enlarging your page is simple and easy with the F12 key, so when you go into an email that has pictures, you can enlarge them enough to see them, true for Internet browsing and the other programs in CDesk too. If you have tremors or palsy in your hands, the company will be putting out a new speech program soon, which works off of CDesk basic commands already, so it is easy to verbally command your computer to do what you need it to do. Your voice just needs to be loud enough to be heard by the mic. It has also come out with a simple small camera that will take a picture of any print work and put it on the CDesk format on your computer for you to immediately have feedback. The more I work with this software, the more I see its potential for those who have difficulties remembering all those commands. In addition, the company: adaptivevoice offers the option to buy a computer, monitor, printer, scanner and software for $1999. Within that agreement is Best Buy will come out and set it up for you. So you can be set up to go in a very short time. Narrator is built into every PC computer, if you are running Microsoft products and their operating systems (OS). If you are using talking software already and you use the following hotkey, the double speech may get annoying, so turn it off. Narrator is a basic program. If you do not have talking software on your machine and need to get it installed, this is a way you can do it independently. It is a basic talking program and does not come close to a speech program such as JAWS, but it does help you to get things setup. In Windows 7, Hit your Start Key+U also known as the Windows key with the Logo+ U – hit ALT+N to start narrator…if you are blind, you are going to walk by faith as you turn on your computer with NO speech and just do those 2 commands and narrator will start speaking to you. A dialog box will open with options, just TAB through to select the ones you want to use and continue with your work on the machine. In XP, hitting the Start Key+U will immediately get Narrator talking. A dialog box will open with options–down arrow to listen to the options, then TAB to your next options, then TAB to OK. 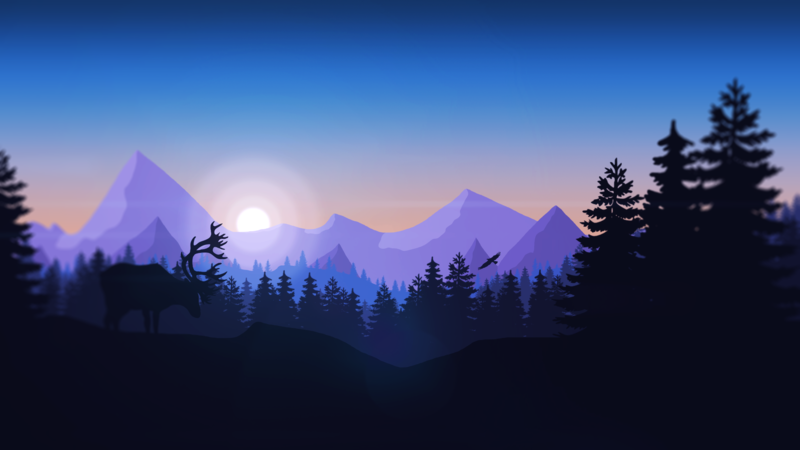 This is a wonderful option for anyone who needs speech to get things setup on his or her new computer or fix one where the speech has gone down. Many do not know that magnification is already on every computer built with Microsoft Technology. On XP, hit your Start Key+U to begin your utility manager. Your computer will begin talking to you also and the words magnifier is not running will be your first options, do an ALT+A to get the magnifier working and turn off narrator if you do not want speech. The magnified part of the screen will come up at the top of your monitor. Take your mouse and drag it to where you want it to be. You can also drag the corner of the magnifier to make it larger and more easily to see. As you move the mouse around your machine, everything will be enlarged in this magnified window. 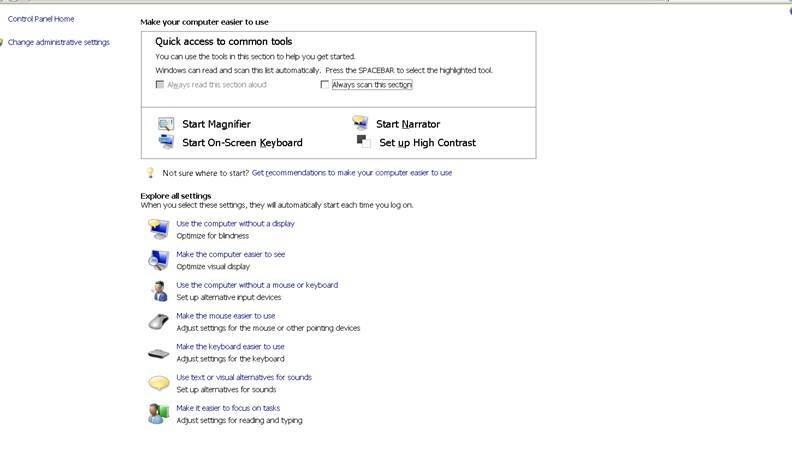 On Windows 7, Start Key+U then hit ALT+G to start your magnifier and Enter to start the magnifier window at the top of your monitor. You can take your mouse and go to the bottom line of the magnified window and while you hold down the left click of the mouse, you can drag down the window to make it larger. Once again, as you move around your machine, everything will be enlarged for you. There are many free options already built into computers today, that you may not need to buy something else. Try it out. The new operating system iOS5 is out and works much better with voice over on your iproducts. The new iphone 4S just works better all-around in so many areas and with the app Siri where you can give voice commands to make it do what you want, frees up more than your hands…it frees up time. But if you are looking for a good word processor for your Ipad that you can use voice over with and a braille display iA Writer at the iTunes store is under $5 . Hook to a Braille display or a Bluetooth keyboard also! If you want to be able to use spell check, it will do that too, rename files, copy, paste, and a host of other options. iA Writer is a really good basic all around writing program and students will love using the braille display with it to get that tactile feedback that helps in their learning. That cause and effect approach..They braille it, hear it, feel it.